You already know that heavy rains and “ponding” water aren’t good for your business’s roof, but what about fluctuating temperatures? You may never have heard the term “thermal shock,” but it’s something that’s common in the South. Our Atlanta commercial roof experts will explain below so you’ll better understand how the weather could impact your roof. Substantial changes in temperature can cause damage to your roof, and if you live in Georgia you know temperatures can change quickly. During spring and summer months, a thunderstorm can roll through and drop the temperature 20 or 30 degrees in a matter of minutes. At certain times of the year temperatures from one day to the next may fluctuate quite a bit; one day it may be 80 degrees, then a cold front comes through and the next day it’s 60. There have even been those rare occasions that snow or sleet are in the forecast along with 70 degree days all in the same week. Tough on the roof! Why? 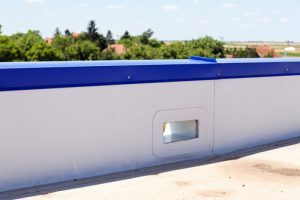 Going from cold to warm temps quickly can cause older commercial roofs or those that aren’t properly insulated to crack or split, resulting in serious leaking. Blisters can become a problem with bitumen roofs if the material bubbles up, a potentially serious (and costly) issue if the problem isn’t addressed by a commercial roofing contractor right away. An already existing tiny hole can become a large hole due to thermal shock, which causes cracking. Small leaks can become a huge problem as extreme temperature changes may cause metal roof fasteners to pop up. With an EPDM roofing system leaks may occur as the flashing can shrink and become detached from your building, leaving an open area. The weather can affect your commercial roof in more ways than you ever imagined. It’s important to know that it isn’t just rain, high winds or heavy snow you need to worry about, but extreme temperature changes in a brief period of time as well. The best way to ensure your roof stays in good shape is to have it inspected and maintained on a regular basis. Taking care of minor problems now can prevent major issues with your roofing system in the future. For all of your commercial roofing needs in Atlanta, count on Kelco!